Uterine fibroids are benign tumor masses that originate from the smooth muscle layer of the uterus. They are exceedingly common, appearing in 20% of women aged 35 and over. They most commonly show in women of later reproductive years, and it’s rare to experience them at a young age. They do not always cause interference with conception and pregnancy, but it is possible. If you are having trouble conceiving, or are simply tired of your condition, you may want to consider looking into acupuncture as a safe and healthy treatment option, alleviating your uterine fibroid symptoms, as well as improving your chances of pregnancy. All women with uterine fibroids do not experience all the aforementioned symptoms. Smaller fibroids may indeed be asymptomatic, but to be safe, one should get routine tests done just to check if everything is all right. Unless the uterine fibroids are causing symptoms, they are not treated. Other women who are suffering from pain and discomfort at the hands of these tumors are prescribed medicines like NSAIDs to battle painful periods, and contraceptives to reduce cramps. These medicines are not a permanent solution, and all your reproductive life, you will have to rely on these drugs, pumping chemicals into your body on a daily basis, creating a toxic environment for both yourself, and your baby. Pills also generally have adverse side-effects, and don’t show results till at least 6 months or a year after, pushing the start of your new family further and further into the future. This is why more and more women are opting for alternative medicine, and trying our acupuncture therapy for treating uterine fibroids. When compared to chemical intervention, acupuncture is a much safer and more effective method of treating your uterine fibroids, as well as improving chances of pregnancy. Acupuncture can be very helpful in correcting reproductive disorders, especially uterine fibroids. The treatment has proven itself imperative in the reduction and shrinking of these tumors, causing the smaller ones to disappear altogether. If the tumor is very large, acupuncture will not be able to get rid of it, or even shrink to that much of an extent, but it will certainly prevent it from growing any larger. 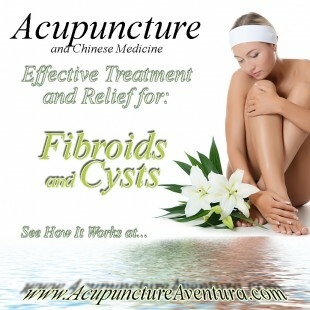 A combination of acupuncture and Chinese herbal medicine can relieve symptoms caused by uterine fibroids, such as heavy period and menstrual cramps. Studies have shown that acupuncture treatment for uterine fibroids leads to reduced tumor sizes, alleviation of pain and discomfort, as well as correcting all your back and abdominal problems. For improving fertility, it may be used in combination with other methods such as IVF, but can be done in isolation as well. At our center in Aventura Florida, we believe in a combination of eastern and western medicine to help you receive the best of both worlds. Acupuncture therapy has no adverse affects for you or your baby, and can help you start a family in a healthy and safe manner. To make an appointment, call us at (786) 537-7022 and we can begin your treatment immediately. We do accept insurance.